PRISTINA: Kosovo police fired tear gas on Monday to scatter hundreds of nationalist Serb protesters outside a round-table meeting on improving relations between Belgrade and Pristina, and briefly detained a hardline Serbian government official. The incident occurred in the town of Mitrovica in a volatile, mainly minority Serb pocket of northern Kosovo still unreconciled to the independence a decade ago of the ethnic Albanian-majority country from Serbia. The round table was part of a dialogue towards normalisation Serbia is conducting with Kosovo, its former province that went to war against repressive Serbian rule in the late 1990s, to help fulfil conditions for European Union membership. But shortly after the round table began, Marko Djuric, head of the Serbian government office on Kosovo, was detained by police because he had been banned from entering the country over nationalist remarks Pristina regarded as inflammatory. 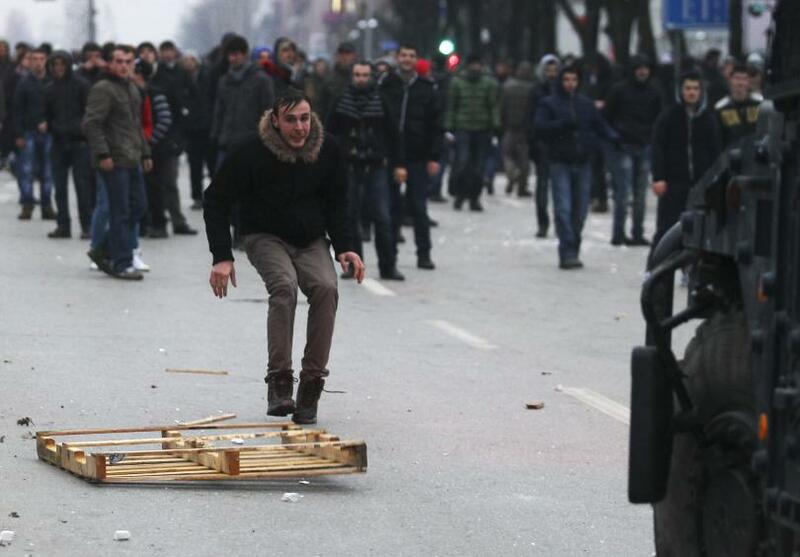 Kosovo police also fired tear gas to disperse local Serbs who gathered outside the meeting venue in protest. Djuric was brought to the Kosovo capital Pristina in a police van and, booed by Kosovo Albanian onlookers, walked in handcuffs into the main police station, a Reuters witness said. But shortly afterwards Djuric was taken to a border crossing and freed to cross back into Serbia. Serbian President Aleksandar Vucic said the Kosovo police’s use of force and the detention of Djuric amounted to a “brutal provocation and the worst criminal act”, while calling on Serbs in the north of Kosovo to remain calm. European Union foreign Policy Chief Federica Mogherini said she had spoken with the presidents of Kosovo and Serbia. “I deplore what happened today in #Kosovo. Need calm & preserve dialogue,” Mogherini tweeted. Kosovo had sent special police units in the morning to the small Balkan state’s north to enforce an entry ban on Djuric and fellow hardline Defence Minister Aleksandar Vulin. Vulin heeded the ban and did not show up at the border. Twenty years after the ethnic Albanian uprising that eventually led to Kosovo’s statehood, some 50,000 Serbs have clung to homes in territory that remains politically loyal to Serbia and is largely in the grip of Serb criminal gangs. Serbia does not recognise the independence of Kosovo but is under pressure to normalise relations before it completes accession talks with the EU. But tensions remain high. On Friday, Serbia cited security reasons in scrapping an international women’s handball match that would have been the first between Serbia and Kosovo.